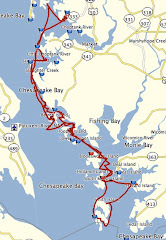 We left the marina just after noon and motored west down the channel to Chesapeake Bay. 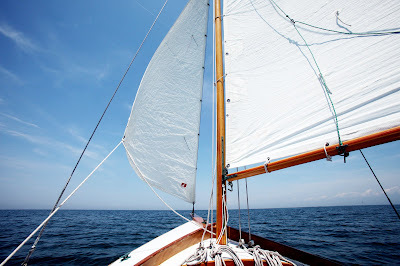 Once clear of the shallows we raised full sail and headed north. 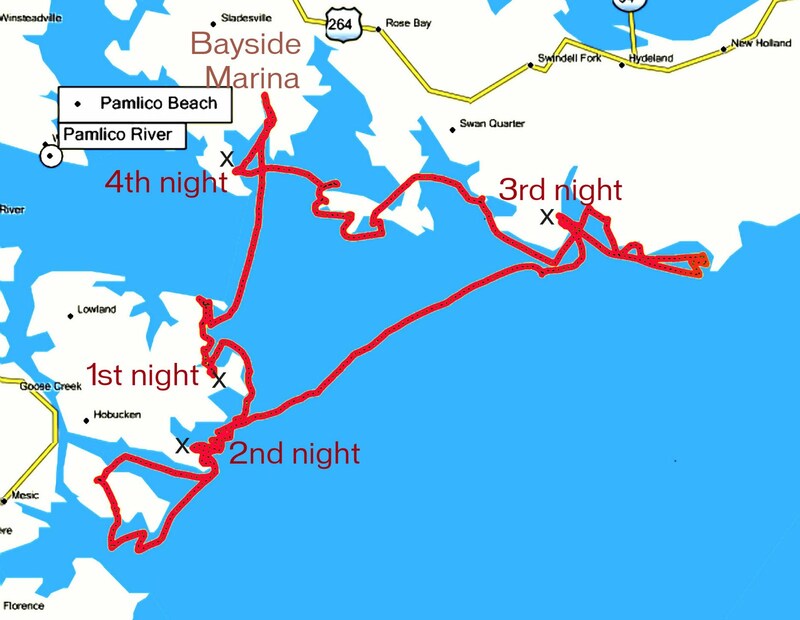 Bruce and I had picked out a few possible stopping place for the night, anywhere between Smith Island and South Marsh Island. 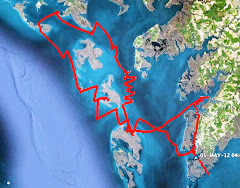 We hoped to get as far north as possible to be in position for an morning visit to Deal Island. The wind was light and Spartina was making just a couple of knots wing and wing. 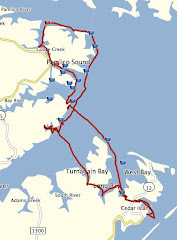 The wind fell off and we motor sailed, more motoring than sailing, just west of Goose Island. 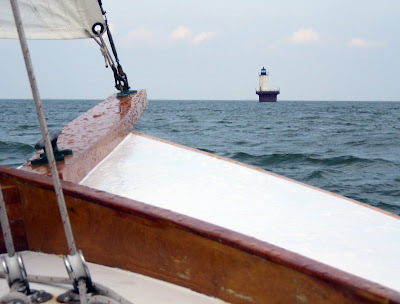 At one point we saw a Tangier Island waterman running his skiff in our direction. 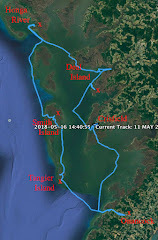 We turned west to give him a clear path and at the point realized he was trying to direct us away from the shallows that run almost continuously from Tangier to Smith Islands. 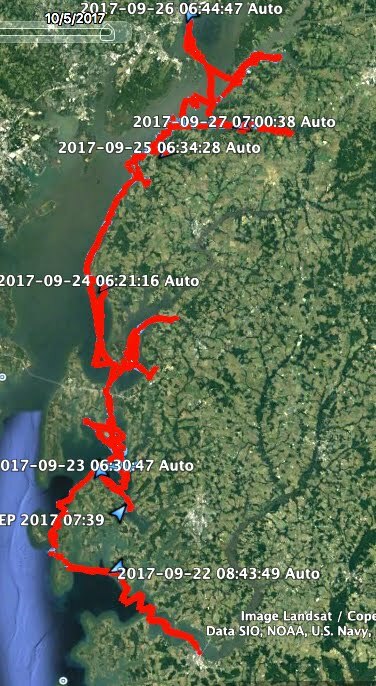 Our charts and Bruce's gps showed a depth of 4 feet, but where the waterman turned us west it had quickly shoaled to two feet or less. 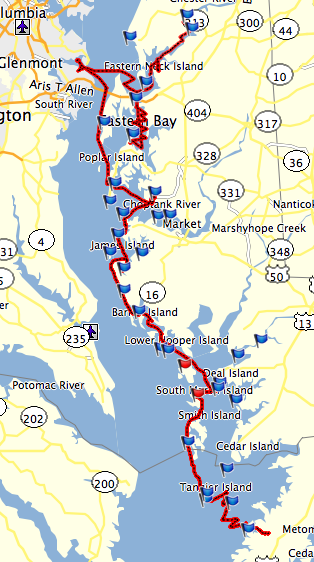 Tylerton and Rhodes Point on Smith Island were in sight by 2:40 as the wind started filling in from the south east. 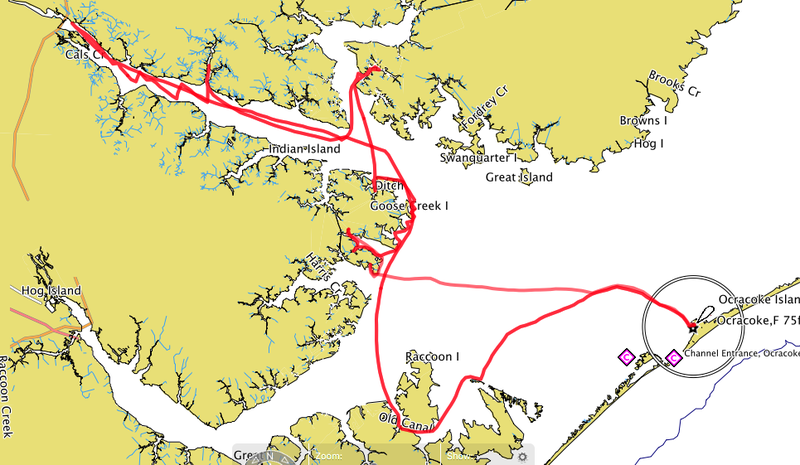 We were doing 3.5 knots as we passed Sheep Pen Gut, the entrance to Smith Island that I used last fall. 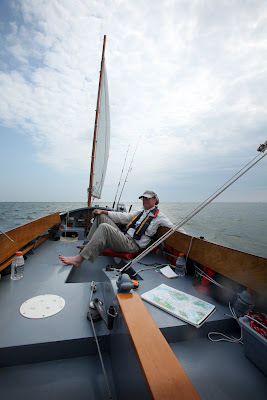 And by the time we passed the Big Thorofare jetties near Ewell we were sailing at over 6 knots. 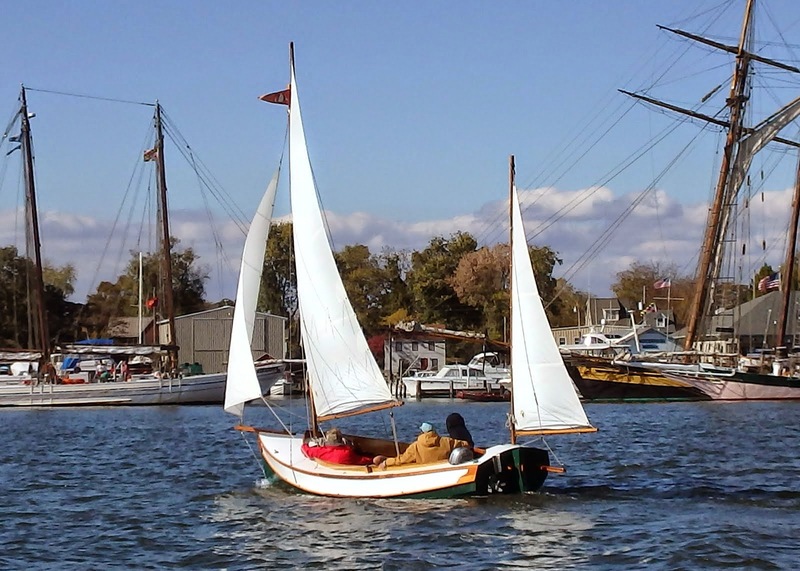 This was fun sailing. 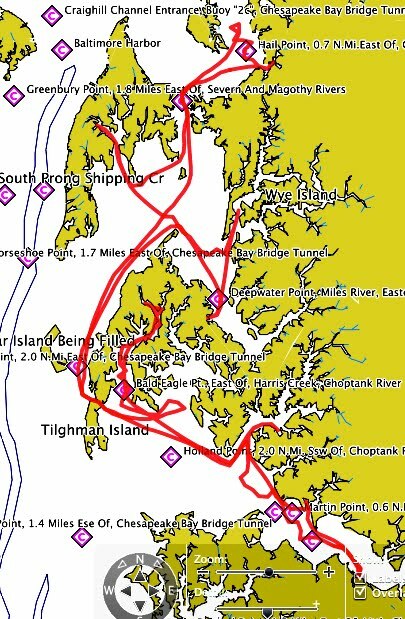 We rounded the northern coast of Smith Island, entering Kedges Straits where we were more exposed to the south east wind and waves. It was a bumpy ride through the straits. 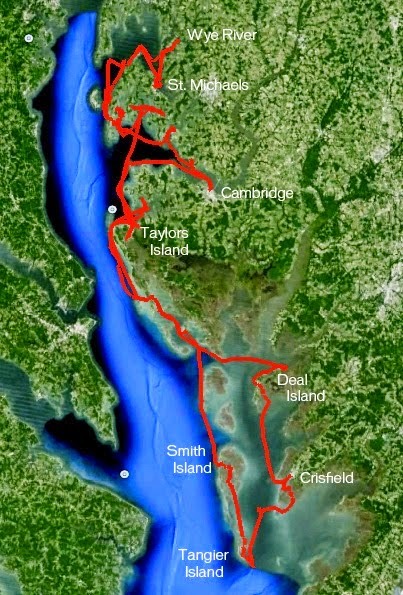 The Solomons Lump light, below, marks the straits between Smith Island to the south and South Marsh Island to the north. 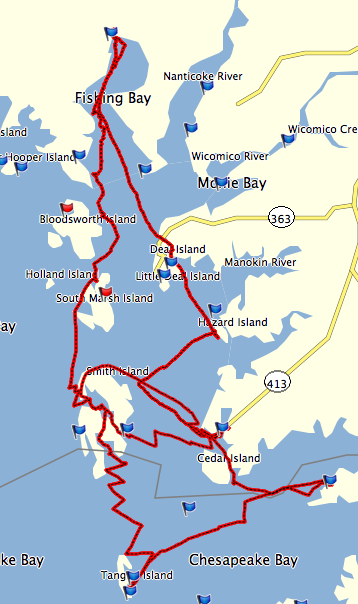 The wind stayed steady on Tangier Sound and the ride was smoother as we turned north alongside South Marsh Island. 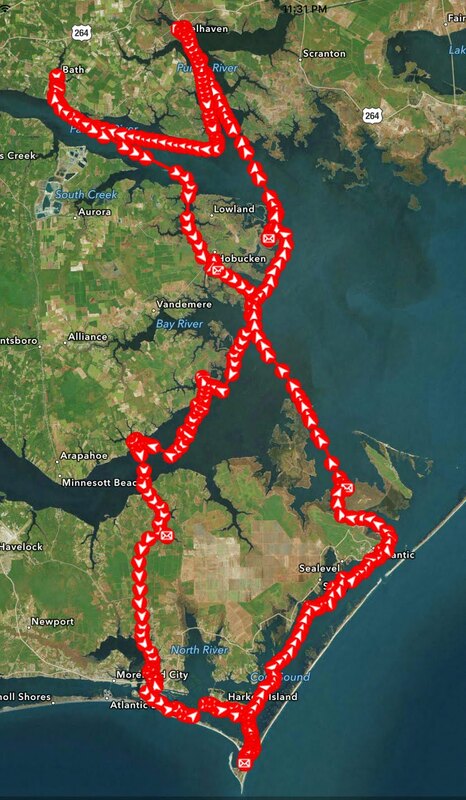 I thought I saw waves or some sort of wakes breaking around Spartina, finally realizing that we were sailing through a school of dolphin. Bruce got this nice photo below, very impressive I think when you consider that it was shot with a point and shoot camera. Nice work, Bruce. 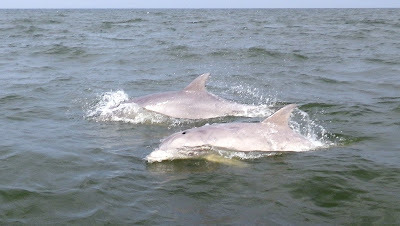 The dolphin around us for about ten minutes, then they were gone. 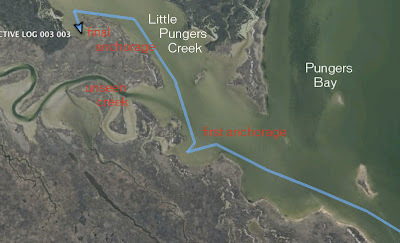 About 4:45 we spotted the ruins - pilings and a platform out in the water - that mark the entrance to Pungers Bay. Outside of the bay we rounded up and dropped the main, then headed in under mizzen and jib. 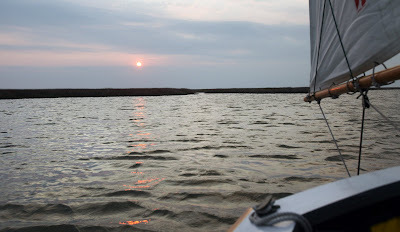 The first anchorage I chose, while protected from the wind, was exposed to waves wrapping around the marsh point. Standing on the deck I looked to the west and saw more protected water. Bruce raised the anchor and we checked three other small coves before finally dropping anchor. 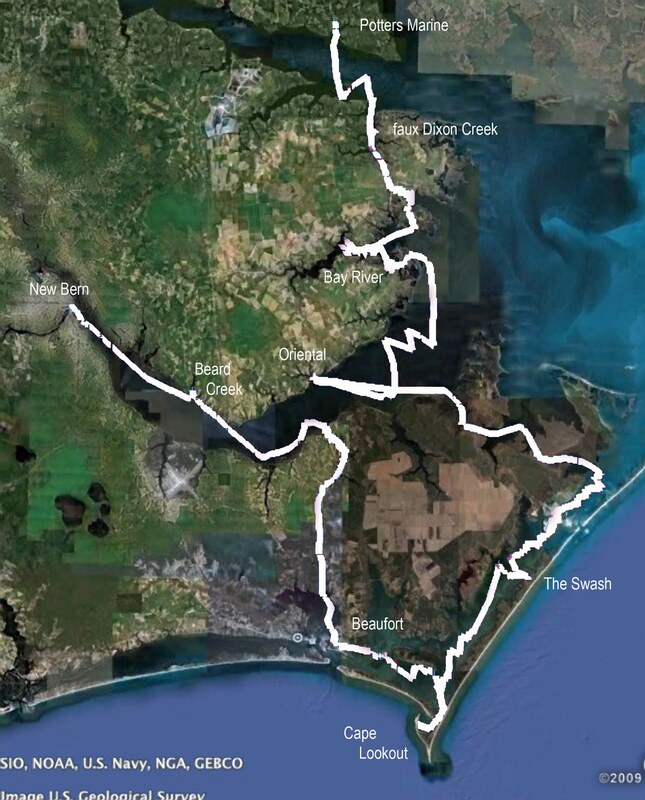 Now that I look at the satellite photo I find it interesting to note that I completely missed the entrance to a nice creek winding its way back through the marshes. 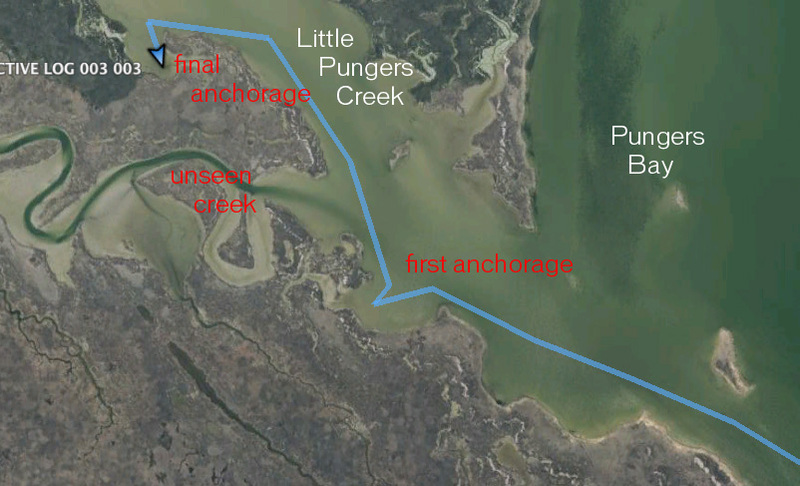 I don't know if it would have been a good anchorage or not, but I wish I had at least been able to see the entrance to the creek. 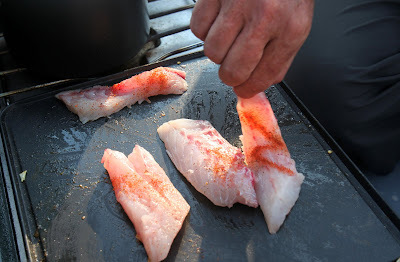 Once anchored I cleaned the fish and Bruce started cooking onions and peppers on the grill. There you see some pieces of the fillets with cajun spice sprinkled on them. There is the finished product - grilled veggies, striper and mashed potato. And I believe we had some white wine with that meal. Pretty good dining for a small, open boat. 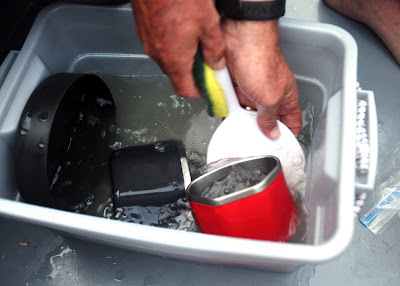 We've had a lot of people ask about washing dishes on the boat. There is our sink, below. Bruce uses the cook kit tub as a sink, washing and then sterilizing the dishes with boiling water. 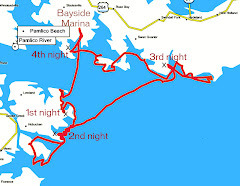 I won't blame you if you don't quite believe what happened on day two of the trip. 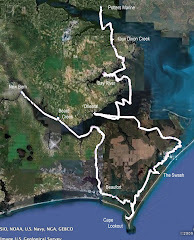 The visit to the sand spit, church bells chiming across the water, soft shell crabs, catching a nice striper, sailing downwind at 6+ knots, being surrounded by dolphin and having an excellent meal with a nice glass of wine - all that in one day is hard to imagine. I might not believe it myself - but I've got the notes, photographs and, most importantly, the memories. 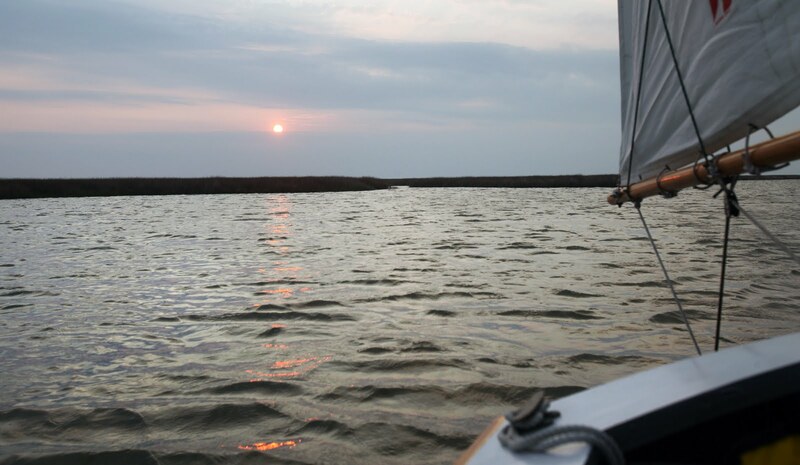 It was one great day on the water. I've been hooking blues in the bay alot lately. What kind of lure are you using? I've got a simple Clark spoon. Sometimes it's like shooting fish in a barrel! I've used Clark spoons in the surf. While sailing I like to use a floating lure with a "lip" that makes it dive. That way it trolls under the surface, but when I stop, come about or whatever the lure floats to the surface and doesn't get snagged on the bottom. 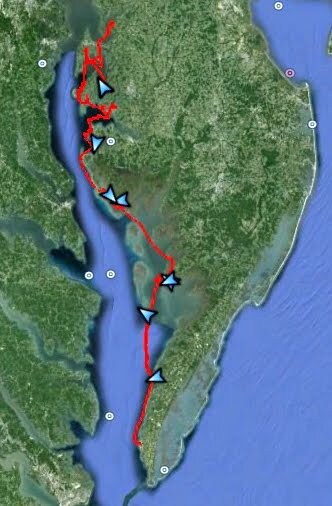 I did see your post/video with the bluefish. Very nice! I would like to know about the grill. Is it over a 2-burner propane camp stove, such as a Coleman? Never occurred to me one could have a grill. 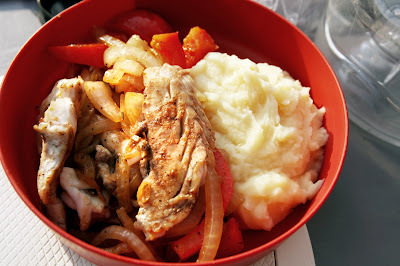 I take a black iron frying pan to cook fish, pork chops, and such. I use a coleman stove with a burner on the right side and a grill on the left. I have never used the original grill, instead I use an option griddle that fits in the same spot. Look through the logs of past trips and you will see it in use. Works very well. How did you manage to get such a good shot of the dolphins? Every time I've tried to get a photo of dolphins near our boat, I end up with a picture of a blank spot of water where the dolphin just disappeared. They move so fast, by the time I hit the button, they're gone.